Had the pleasure of giving a VIP tour to my brother, Chris, Saturday afternoon. You can see his smiling face in the picture above - and you can see a glimpse of my official curator's sweatshirt - thanks to my loving family for this great Christmas gift! 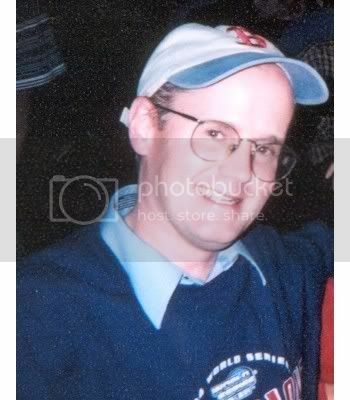 Thanks to the curator's son Andrew Logan for his help with the card (as is tradition!). I hope your holiday season is filled with peace. Have a healthy and happy 2010. Whenever we drive across New York on the thruway, we make it a point to stop for a break (read: brewery tour) at the West End/Matt's Brewery in Utica, New York. 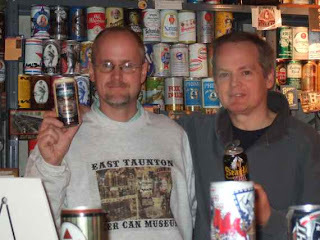 From Utica Club, to Matt's, to Saranac Black & Tan, they have always known how to brew good beer in Utica! 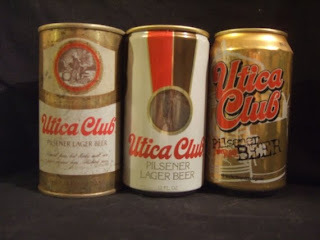 Today I highlight just a few Utica Club cans from the museum shelves for your viewing pleasure. I really could've focused more when I snapped this picture! 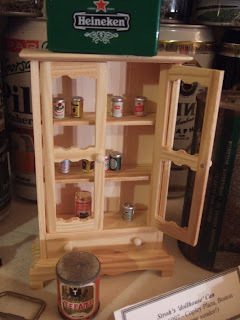 I always get a kick out the fact that the manufacturers of 'dollhouse miniatures' remember to create tiny beer cans for use in doll houses. We have a nice little group of these cans in the Beer Can Museum, so today I share them with you all for your viewing pleasure. Note the brands; Colt 45, Schlitz, Heineken, etc. Intricate details include the stay on tabs.